This is an upcoming publication of MERC Global and will be launched soon. MERC Global's International journal of Management Cases (MERC Global's IJMC) is an international peer-reviewed biannual journal, being brought out with an endeavour of lavishing an international communication medium for all the management stakeholders. MERC Global IJMC is committed for becoming an authoritative source of the case studies to foster teaching, learning and research in academics; professional practitioners in business decisions; knowledge bodies, and other stakeholders. MERC Global's IJMC is a biannual journal published in January and July every year. 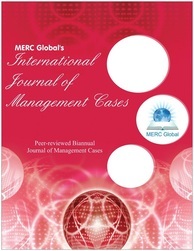 MERC Global welcomes the authors to submit concise as well as descriptive case studies based on the interdisciplinary research of management with other business functions for MERC Global's International Journal of Management Cases. The author(s) may submit the soft copy of manuscript in MS Word format after preparing the same as per guidelines for authors at: editorijm@mercglobal.org. In case of any query, please feel free to contact.